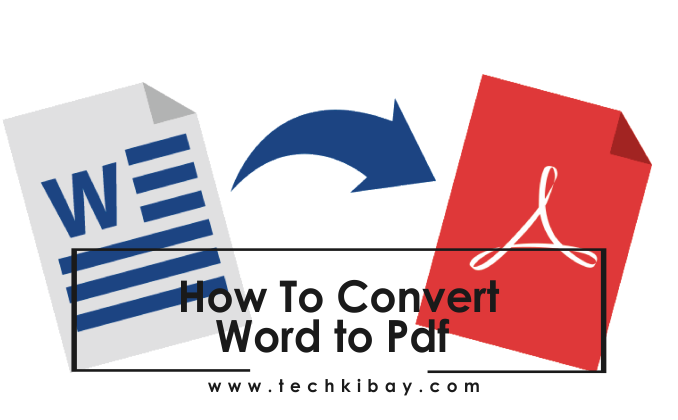 The need to convert word to Pdf shouldn't be a challenge anymore as conversion has become a lot easier. Thanks to the ton of free online and offline tool that can be used to convert word to pdf in a matter of seconds. Pdf which is an acronym for Portable Document Format is a popular file format use in saving and sending electronic documents in exactly the intended format. In simple terms, the Portable Document Format (PDF) allows you send documents to people without them messing with the contents of it. So for what so ever reason, if you need to get a Word document converted to pdf in the slightest of seconds, you can quickly convert Word to Pdf with any of these online conversion websites. SmallPdf is a word to pdf conversion website that makes it as easy as possible to convert your doc files to PDF online. You don’t have to adjust any settings and the best part is that word to pdf conversion on SmallPDF only takes a few seconds. Seriously, who loves PDF when there's so much more to love in the world; money, women and cars? Lol. Well, this website loves pdf and it can help you convert Word to Pdf in a flash. With FreePdfConverter, you can Convert Word, Excel, PowerPoint and other files to PDF. When you sign up, you can convert an unlimited number of files, no delay between conversions, no queue, convert all PDF pages and much more! Wordtopdf provides a tool that lets you convert word to pdf online. The website is easy to use and navigate. WordtoPdf gives you a choice of sending a converted file to your email address. If you've been feeling headaches finding the best PDF converter website, then look no further than PdfOnline. The online pdf converter is very efficient. Conversions are made in seconds. Converting word to pdf on PdfCandy is also efficient. To convert your Word document to PDF format using PdfCandy, you need to first add the files of supported formats (DOC, DOCX or ODT) for conversion – drag and drop them or click the "Add file" button. The conversion process will begin automatically. When it's complete, click "Download PDF file" button to save your new document. With Online2Pdf you can quickly get your doc file converted to pdf in no time. The online converter also lets you merge, edit and unlock pdf. While you can always convert a doc file to pdf offline using Ms Dos 2010 and later versions, with any of these 8 Free Online Converter Websites, you can easily convert word to pdf in a jiffy. Thanks for this collection! However, my favorite is missing: CloudConvert (https://cloudconvert.com/doc-to-pdf). Quality wise the best one I have tried so far. Maybe add it as 9.? Thanks for your thoughtful comment. Just checked CloudConvert. Pretty cool as well. Thanks for this update. iLovepdf was my favorite. iLovePDF is great! Thanks for stopping by.